On May 29, 1775, the Second Continental Congress formed a Committee of Investigation to plan America’s national post office. Benjamin Franklin was a member. Just six weeks earlier, Paul Revere had warned the British were coming, followed by the Battles of Lexington and Concord. On July 26, 1775, the Second Continental Congress appointed Benjamin Franklin as the first Postmaster General. He then wrote to Jane Mecom, “I have now upon my Hands the Settling of a new General Post Office…” Twelve years later, Article I, Section 8 of the U.S. Constitution declared Congress shall have the power “to establish post offices and post roads.” When President Nixon signed the Postal Reorganization Act on Aug. 12, 1970, the stated USPS mission was “to provide postal services to bind the Nation together through the personal, educational, literary, and business correspondence of the people.” Its organization changed, but the purpose was not. USPS would continue to embody the principles of independence and national unity which it had possessed since those early colonial days. Then, in 2006, Congress enacted the Postal Accountability and Enhancement Act (PAEA). The bill was a bipartisan effort initially co-sponsored by U.S. Representative Tom Davis (R-VA), Chairman of the U.S. House Committee on Government Reform, which includes jurisdiction over the USPS. Davis was joined by John McHugh (R-IL), Ranking Minority Member Henry Waxman (D-CA) and Danny Davis (D-MI). It passed the House by a voice vote on Dec. 8, 2006 with no changes made and then passed the Senate “by unanimous consent” the following day. President Bush signed it into law on Dec. 20, 2006. Among a slew of other procedural reforms, the enacted law mandates that the U.S. Postal Service must make prefunding payments towards its future healthcare obligations no later than Sept. 30, 2007. The minimum payments began at $5,400,000,000 and went up from there. USPS has not met these mandated financial obligations. Is prefunding retiree’s healthcare obligations a good idea? Postal retirees’ healthcare should remain covered, even if those costs increase with age. That comes with the territory of growing older. At the same time, the statutory payment amounts are required regardless of USPS profits each year. Whether it earns a net $10 billion or loses $10 billion, these amounts remain balances due. As a result, the USPS has reported billions of dollars in losses over the past decade. It hasn’t even made the mandated payments. While $20.9 billion was paid, $28.1 billion was in default last year. PAEA’s intent was proactive. The benefits problem is real and not unlike the persisting scare facing the Social Security Administration which noted in its report last year, “The Trustees project that the combined trust funds will be depleted in 2034…” Social security reform proposals also revolve around a prefunding approach. Government must plan for the future; that is responsible public administration. Yet in assigning a preset dollar amount, Congress did not anticipate declining mail revenues and the advent of the Great Recession which began in 2007. Establishing a national post office was one of the earliest acts of American rebellion, predating the Declaration of Independence itself by a year; its existence was thus of deep, primal importance to America’s Founders. Chaffetz’s committee offered a bipartisan solution to reform USPS again, one which modified the prefunding mandate. Because that bill died at the end of the 114th Congress, any postal reform proposals must restart the entire legislative process. 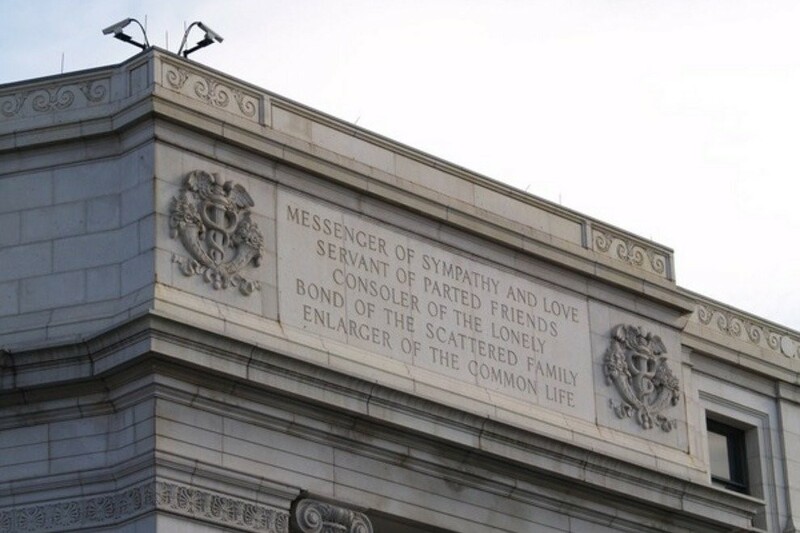 A bold inscription adorns the façade at the National Postal Museum in Washington, D.C. only a few blocks away from the U.S. Capitol Building. It reminds us all how USPS fulfills a vital role as an “enlarger of the common life.” Hopefully the 115th Congress will remember it, too.